What happens when you take the sort of predictive analytics that are more commonly used for predicting election outcomes and stock market movement and apply them to cloud infrastructure? Well in Netuitive’s case you get a provider that aims to make control over cloud infrastructure automatic, using forecasting, diagnostics and automated provisioning. Sounds interesting but first some background. 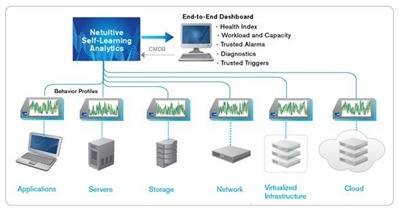 Netuitive aims to replace manual policies, thresholds and rules with a self learning and continuously adaptive platform that applies statistical analysis to cloud utilization o ensure provisioning is appropriate for the load at hand and, more importantly, provision remains sufficient for the expected future load. At the moment Netuitive only provides the forecasting and diagnostics parts of the pie, but in Q1 2011 they intend to release their autonomics offering that will automate provision and allocation based on the finding of he analytical parts of the product. Of course the proof of the pudding is in the eating and until we see the efficacy of Netuitive’s offering (especially once the autonomics aspects are rolled out) we’ll have to take it on faith that this thing will actually work and that, as promised, provisioning will be what is required, no more and certainly no less. If it works as it says though, Netuitive should be a useful offering for large organizations looking to automate their cloud (and non-cloud) scaling.